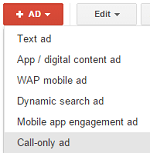 The AdWords team has introduced a new ad type to the mix – Call-only ads. This is a great addition for those who value a phone call even more than on-site engagement. It’s perfectly understandable to be skeptical as new features like these can be unpredictable when introduced to an account. Don’t fear though because, like anything else in Google AdWords, there’s a way to test call-only ads. 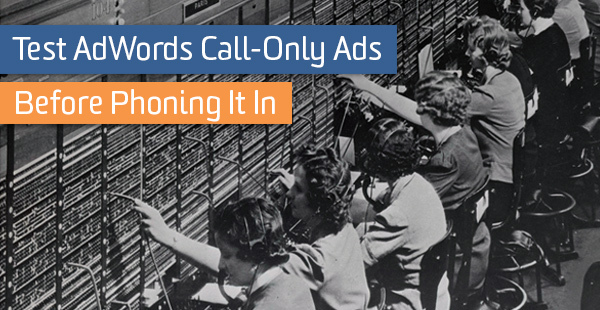 What are AdWords Call-only Ads? Google AdWords advertisers can create search targeted campaigns and ads dedicated to the mobile audience that focus on phone calls as a conversion point. These ads are only eligible to display on devices where a phone call can actually be made. This is the closest option to building a mobile-only campaign since Enhanced Campaigns were thrust upon us over a year ago. You can also incorporate call-only ads into any campaign that is opted into “All Features.” Simply create the call-only ad as you would for any other ad type by selecting it from the ad creation drop-down menu. Now it’s go time. Run the campaign for a significant period and gather your results for later analysis. Assuming you’ve set everything up as detailed above, you should start to gather data on your call-only ads. In this example my test involves A/B testing a mobile-preference ad against its call-only counterpart. Looking at the % Served column, we can see that these ads are getting about equal exposure. The results of my ad test tell me that user engagement with call-only ads in this setting is quite low since CTR is well below the standard set by my mobile-preference ads. The low CTR has also appeared to result in an ad rank hit. We see the results of this by way of a dramatically inflated average CPC matched with a decline in average position. What about conversions? Depending on how you look at this test we could argue that conversion performance has actually increased. Cost per conversion has declined significantly and every click has been counted as a conversion. It should be noted that this particular test represents non-branded, generic search. Since the ad isn’t generating a high CTR and I’m not actually generating visits, I need to ask myself if I want to continue paying above average CPCs for a relatively low total number of conversions. I would want to continue testing the ad type in different scenarios. What might happen if I run the same test with my branded keywords? It seems obvious but certainly worth pointing out, call-only ads do NOT drive traffic to your website. They generate phone calls. Although you will be required to supply a verification URL, this is only used to confirm that the number you’ve defined in your ad text can be used to reach your business. Since these ads don’t drive traffic to your website you may experience a decline in mobile sessions (and mobile on-site conversions) following launch. You will also get little detail as far as user experience is concerned as a result. Keep a sharp eye on your Google Analytics data. No sessions means no behavior metrics, no event tracking, no Google Analytics data. Unless you’re tracking offline conversions but that’s a conversation for a different day. So, what do you think? Do call-only ads fit into your strategy? Give them a test and let us know how they work for you.